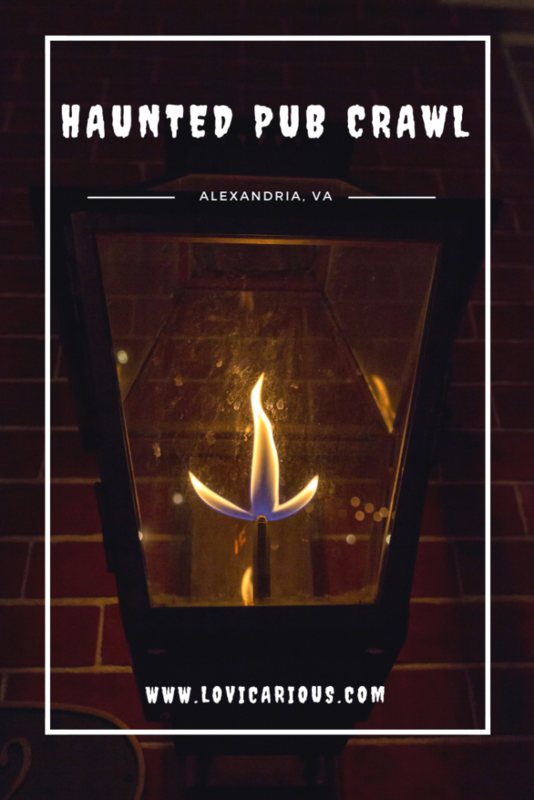 Sure you can take an ordinary ghost tour of old town Alexandria, or… you can toss a few drinks back, walk down some dark alleys with a woman in a colonial dress, and really have an adventure to remember. This is just the experience you will get when you book a tour with Nightly Spirits. When we came across the website for Nightly Spirits, we discovered that the company evolved from the combination of the creators’ two passions: beer and ghosts. I love boozy brunch, so boozy ghosts? Let’s do this! 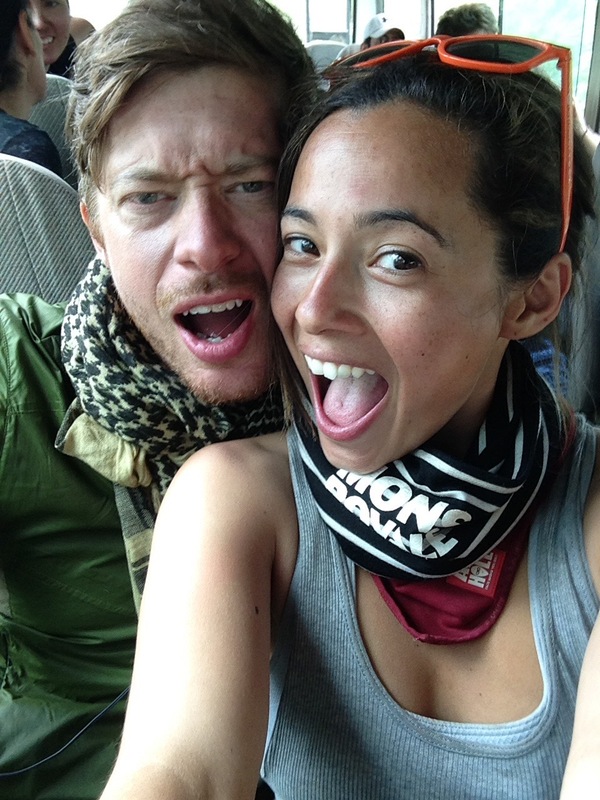 Never the ones to turn down a new and possibly weird adventure, we knew we found the perfect tour for us. The Friday night of our tour, we headed over to the Warehouse district of Old Town Alexandria. This is where we would be meeting our guide and tour group. Arriving a few minutes late, it was not hard to spot our group, easily identified by the glow stick necklaces adorning their heads like ravers in a club. But just in case we couldn’t find our group by the neon pink and green lights, our tour guide was there in the middle of the pub dressed in an 18th-century Victorian dress. I am glad that our host set the mood right off the bat with the appropriate mood and knowing what to expect. This is not the right tour for you if you are uptight, critical, or judgmental. No one likes a “negative-Nancy-know-it-all” when taking a tour, especially when it has to do with something like ghosts. Not to say that I am a believer in ghosts myself. I don’t actually know if I do or if I don’t; but, I also don’t like a smug smarty-pants challenging the guide every 5 minutes with snarky comments. One of the first stories which we were introduced to, takes place at an unassuming ice cream shop at 107 N. Fairfax St. This was the fated love story of Alexandria’s favorite 19th-century couple, Laura Schafer and her fiancé. A few nights before their wedding, Laura was climbing the stairwell to her bedroom when her kerosene lamp fell. Kerosene splashed onto her dress quickly igniting her gown. She ran toward the doorway, but a gush of wind from the open door fueled the flames, engulfing her in a ball of fire. Only a few days later, her mourning fiancé took a gun to his head to join his beloved in the afterlife. Today, some staff and customers of the ice cream shop have claimed to feel an unexplained gush of heat pass by when waiting in the foyer. Others report hearing a woman weeping at night. Another story famous to Alexandria’s paranormal history is that of “the female stranger”. According to lore, it was the year 1816 when a young couple arrived at Gadsby Tavern, the center of Alexandria social life at the time. The man carried in his young wife who appeared to be very ill. For three weeks, medical personnel and hotel staff would tend to the ailing women in room 8. Upon her death, the husband gathered all witnesses to swear an oath that they would never reveal the identity of either the man or woman. 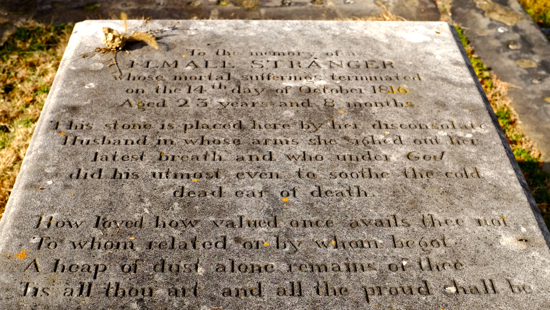 The girl with no name was buried in nearby St. Paul’s Cemetery where you can still find her headstone today. The loving letter inscribed upon the stone begins “to the memory of a Female Stranger”. 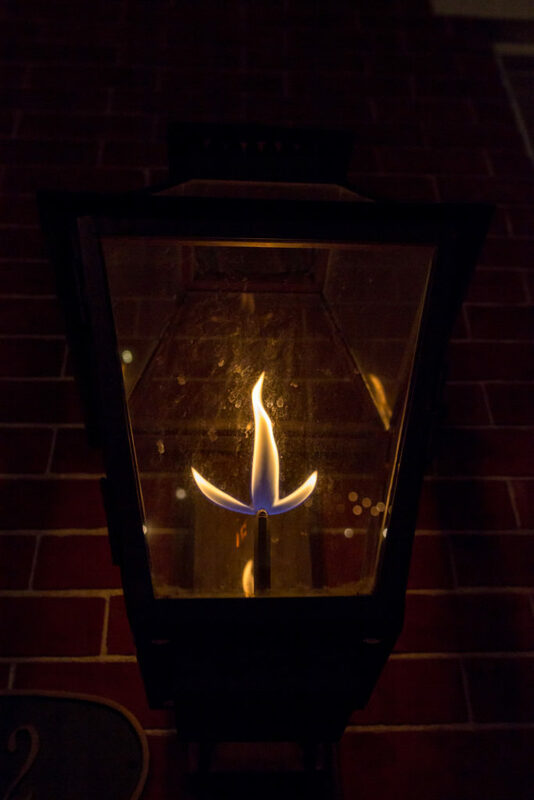 Over the years including very recently, people have reported seeing the “Female Stranger” throughout Gadsby Tavern. She has been seen gazing out the window of room 8 and wandering the upstairs hallway. Even guests of the exclusive Civil War Ball, have noted sometimes seeing an eerie figure standing in a corner of the ballroom during this annual event. 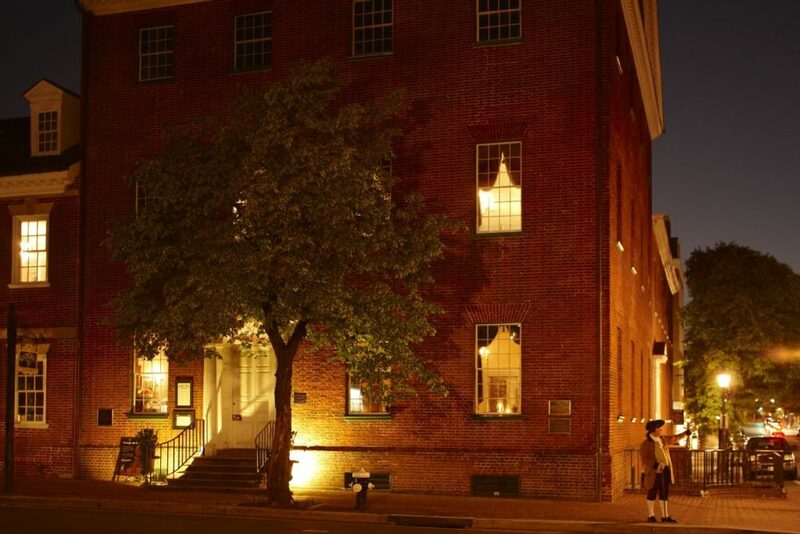 The Gadsby Tavern has received the most reports of hauntings within Old Town Alexandria. Between stories of ghostly hauntings, we popped into several pubs for drinks. Escaping the cold December air, we gulped down multiple Hot Toddies and pints of hard cider. By the end of the 2.5-hour tour, the impact of our libations was quite evident. The members of the tour were a bit more “fun” than when we started. I could even detect some slurring from the tour guide as she recounted the last story while tossing her cape behind like a colonial superhero. So is Old Town Alexandria really haunted? Well, I don’t know, I’m not some paranormal expert. I’m just like the creators of Nightly Spirits in that I’m in it for the Booze and the Boos…especially the booze. Old Town Alexandria certainly has its share of history from the invasions of British Red Coats and sunken ships to innumerable Civil War deaths in Alexandria’s Mansion House Hospital. The history is there, but it is up to you to decide if these hauntings are nothing more than fiction. If your interest is piqued, we highly recommend going with Nightly Spirits. It is a unique and fun way to see the town. As I mentioned previously, do not go into it expecting a slow and conservative tour. This is an experience which involves bar hopping in crowded pubs and a plentiful amount of cheeky jokes; an experience which I find far more entertaining. 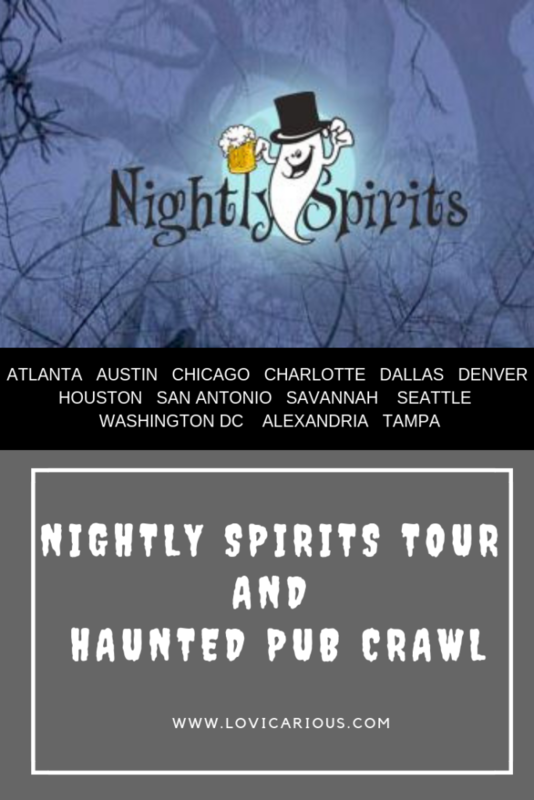 Nightly Spirits is an experience unlike any other tour, which is why it is consistently rated as one of the best tours in the cities which they serve. 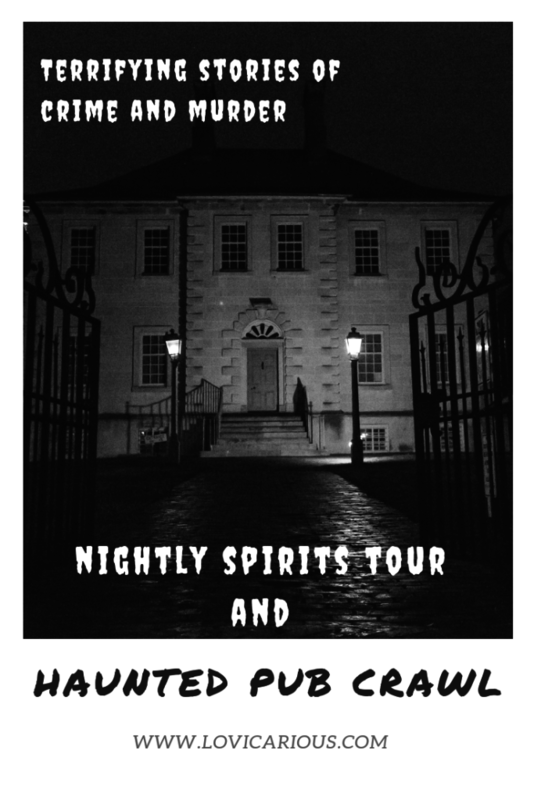 During the 2.5 hour tour, you will hear some of the most famous hauntings as well as some of the lesser known ghostly accounts which have been reported in the pubs, hotels, brothels, undergrounds and other buildings. Nightly Spirits has been featured in CBS News, XM Radio, The Travel Channel, Washington Post, and US Airways Magazine. Interested in more of our haunted adventures? Don’t miss our trip to the haunted Sanatario Duran, a location which has caught the interests of paranormal experts from around the world. Gosh these got my hair standing on ends. You know as much as love reading ghost stories, I don’t think I’m brave enough to be in these places. Really? You have to check them out! Some are scarier than others. I personally don’t like to explore haunted abandoned places by night. That gives me the creeps, but an actual ghost tour with other people where there are street lights? I can do that. Haha I thought that line was so clever when she said that! You should check it out, they have locations all across the US.